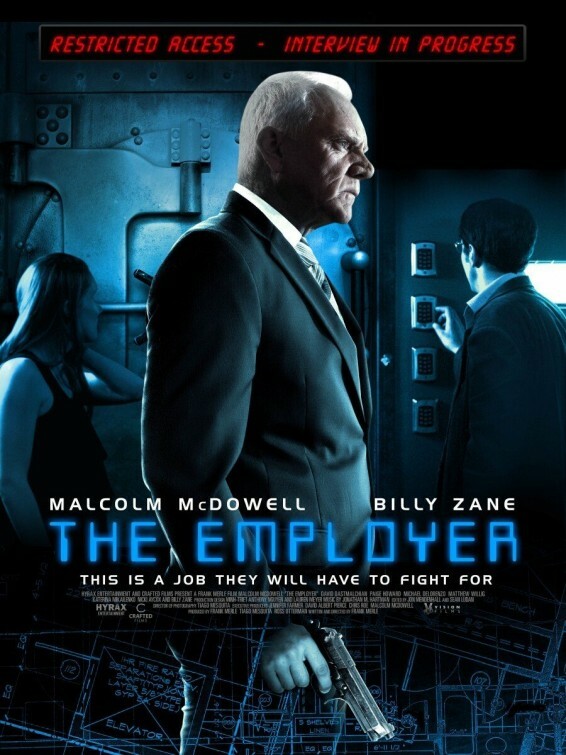 The Employer is a modern day suspense/thriller about a shadowy corporation with a unique way of having potential job candidates compete for a job – basically, after an interview with the big boss, the candidates are kidnapped, put in a room and advised that whoever’s left alive will get the job. While this film may sound like a little bit of Saw mixed with a dash of Swimming with Sharks or even a pinch of Glengarry Glenross, it definitely has its surprises. The film, while imperfect, has unique, identifiable characters, which kept me guessing as to the outcome of the story. 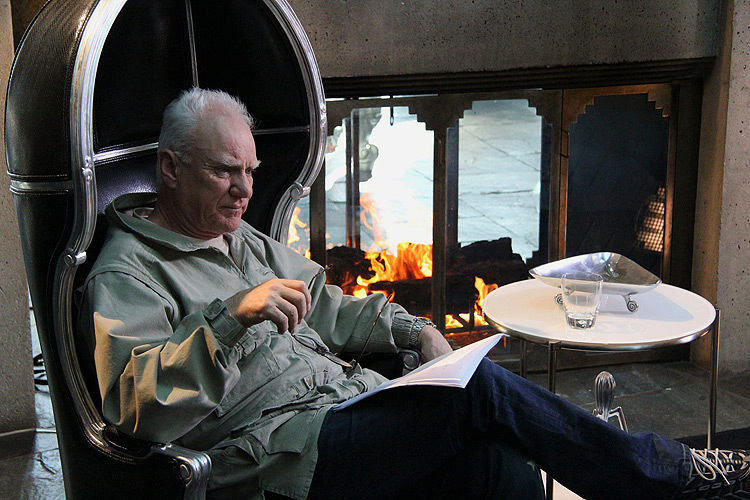 My first question is this – how good is Malcolm McDowell? The guy has been in over 120 films and he just keeps getting better! As the title character, McDowell plays the role as you might expect a veteran star would: he’s funny in this scene, terrifying in that scene, coddling one of the job applicants in a flashback and absolutely tearing them to shreds with his delivery of the dialogue in a third act scene… Personally, I felt like his character (officially credited as “the Employer”) had some contradictions – not to mention that some of the exposition in the second act could easily have been replaced with more scenes of the Employer chatting business with other parties. But regardless, his performance was one of the film’s real strong points, complete with his fountain pen and hand sanitizer props. Concerning McDowell’s “maestro” abilities, let me put it this way: in acting classes, there is an exercise where Actor A has a line and Actor B has a line, and until they’re stopped by the moderator, they simply repeat the lines to each other – and react accordingly. It’s a listening exercise and forces the actors to spend more time listening, digesting and reacting to their partner’s line than thinking about how they’ll say their own line. Well, in The Employer, there are several scenes in which the Employer asks each of the candidates questions – and usually, they were questions we had heard before! But that’s where McDowell is impressive – each scene felt unique because he was chatting with a different candidate, with his/her own motivations, strengths and weaknesses. On that note, a positive element to this movie was its unique mix of characters actually locked in the room together. We’ve got James Harris (David Dastmalchian) as the least qualified applicant, a timid and proud fellow who’s been out of work for six months. There’s the enormous Mike Drake (Matthew Willig), a bodybuilder who seems to have one of the best morals of the group. Mike seems to be a polar opposite of Keith Caverns (Michael DeLorenzo – anyone else watch Head of the Class back in the day? ), who seems motivated to aggravate and annoy everyone in the room for some reason! There are two ladies, as well: Billie (Katerina Mikhailenko), a model type with some provocative high heels and a sassy attitude, and Sandra Turner (Paige Howard) who seems to be the most qualified for the job based on her business experience and cutthroat actions revealed in her flashbacks. Even though the film takes you in some fairly obvious directions at times – Turner seems to partner up with Harris, Drake and Caverns are at each other’s throat – I was pleasantly surprised with some of the reveals and flashbacks in Act Three. That said, the viewer has to hang in there with this title for an ending that is as interesting as the film’s premise. The Employer makes its worldwide distribution premiere “On Demand” June 7, 2013: Comcast, Cox, TimeWarner Cable, Brighthouse, AT&T U-verse, Verizon FiOs, Charter cable, and more! Computer and device users also gain access on June 7, 2013 via Amazon Instant Video, Apple iTunes, Xbox Live, and Sony PlayStation. The DVD release is set for July 2, 2013 at WalMart and Amazon.com. 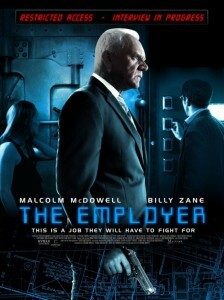 I caught an advanced screening of The Employer and I really liked it. It was full of twists and suspense. It had an interesting story with interesting characters (but not off the wall characters, they were normal, which made the story seem more real). I agree with you Malcolm McDowell is a great actor and was great in this film. He knows what he’s doing. And yes, what is with Michael DeLorenzo’s character, I wanted him dead right away. When I think of DeLorenzo though, I don’t think of Head of the Class right away but the movie A Few Good Men and going way back I remember him from Fame. But yes, definitely a thumbs up from me. Great article about a great actor, and a movie I thoroughly enjoyed. Wish he would of given the up and coming cast plus Michael Delorenzo some more run, but all in all a very well articulated review!